Rochelle is a vivacious 14-year-old girl, the eldest of four sisters and one brother. Together with her mother, they reside in a humble shanty by a sewer-stream laden with trash in Bulacan, about an hour drive North of Manila, Philippines. 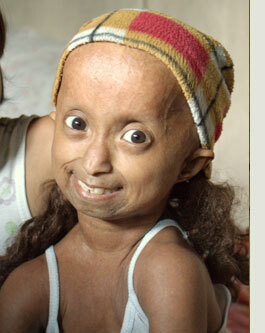 Rochelle is afflicted with a rare genetic case of Progeria or advanced aging in children. This genetic disorder is also known as Hutchinson-Gilford Progeria Syndrome (HGPS) and has no known cure. Our Project Michelangelo team comprising May Banawa, Sherbien Dacalanio, & Jojo Sayson visited Rochelle in July, 2011 where we had introduced ourselves as friends who will help her achieve her dreams… The first is to bring her family to a famous vacation spot, the white sand beaches of Boracay Island. Plans are currently being undertaken to prepare all the necessary logistics to fly Rochelle to be chaperoned by Project Michelangelo volunteer May while Sherbien, our official videographer will film a documentary for posterity. The rest of the family will travel by land and ferry to meet up with Rochelle at the destination hotel. Her second dream has been realized already in August 2011 through the hard work and ingenuity of Sherbien. This event was a reunion of forgiveness between Rochelle and her Father who had recently lost his right hand in an accident. Rochelle needs help as functional living expectancy is unpredictable for her age. Life is beautiful and Rochelle exudes energy and cheerfulness like no other. She has blessed us with her presence and she continues to inspire many around the world with her charm but most of all she loves the Lord. Help us help her create happy moments to turn into lovely memories that will resound eternally in heaven. Her innocence and acceptance makes her a powerful spirit. Let us help Rochelle.